Largemouth? Wait, is it a smallmouth? No, one heck of a striper! 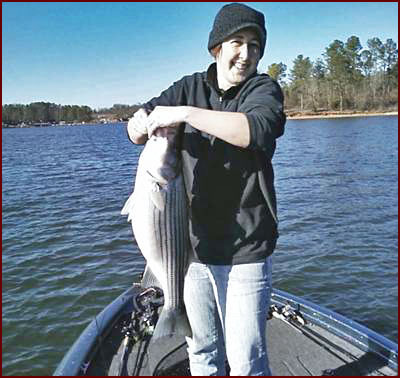 My wife, Beth, while fishing a jerkbait around brush piles in about 16' of water, enticed this solid striper to venture out and smack her lure. We were fishing main lake points targeting bass. The largemouth on Lake Greenwood are in their prespawn pattern staging on these points. The stripers are there as well so you never know what's going to take a swing at whatever lure you're using. Any cast can bring a surprise. Well, this one wasn't bass but it was a still a ton of fun with the wife on beautiful afternoon on the lake.